A reconstruction of ninth-century gardens in the Forum of Caesar, Rome. 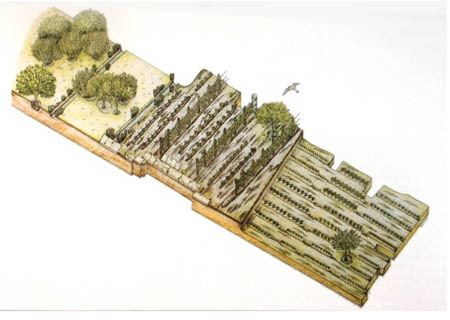 On the right are rows of vegetables, on the left and center are grapevines, vegetables and fruit trees. Urban agriculture, according to most definitions, is the practice of cultivating, processing, and distributing food in or around a village, town, or city. That locational aspect is crucial to distinguishing urban agriculture from generic agriculture, which most people associate with taking place in rural areas. Urban agriculture projects include: community gardens established on vacant land that’s cultivated and maintained within an urban neighborhood; school gardens cultivated and maintained on school grounds, and factor into the curriculum; entrepreneurial gardens that grow produce and flowers for profit; backyard gardens, windowsill gardens, and rooftop gardens that provide vegetables, herbs, and flowers to individuals and/or small families. The growth of community gardens, educational farms, school greenhouses, college plots, backyard growers, rooftop gardens and container operations in urban areas of the US indicates the current breadth of interest in producing food by city residents. Such a flowering has not been seen in many years. The history of agriculture in cities, however, goes back thousands of years and may surprise some readers. We have traced that history here. Urban agriculture is a broad topic with a range of issues. Here, the focus is on how farmers get and hold land for commercial farming in urban areas. An “urban area” is typically a densely built environment. Most urban areas are within city boundaries, but cities can include more suburban settings with significant open spaces. 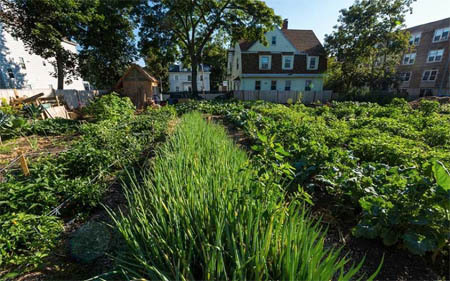 For example, Urban Edge Farm (UEF) is within the City of Cranston, Rhode Island. It occupies 20 acres, surrounded by scattered rural residences. While farms like UEF are subject to city ordinances, many of the other issues discussed here would not apply to UEF. It is not surprising, to anyone who reflects on the matter, that the Ocean State should have the most expensive land prices in the country. Averaging $13,800 per acre, Rhode Island is comfortably ahead of New Jersey’s $13,000 average price. Much of the state is either on or within sight of the ocean, driving up prices. Urbanization is also strong there. It shares with only one state, again New Jersey, the distinction of having more than 1000 residents per square mile. And only New Jersey and the District of Columbia equal its percentage of area in metropolitan districts — 100%.